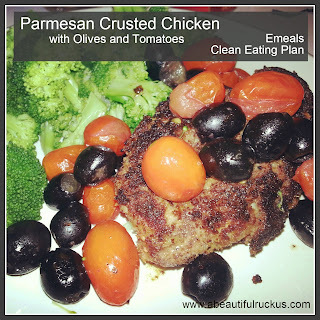 A Beautiful Ruckus: Meal Tip #1: EMeals + A Giveaway! Meal Tip #1: EMeals + A Giveaway! One of the questions that showed up several times was how we do meals at our house. Sheesh, having a suddenly big family definitely makes one grasp for any shortcuts, money saving tips, and kid-friendly meals they can find. I have several tips that I'd like to pass on, but today I'm excited to share my favorite one that we've adopted since our kids came home. And unless you absolutely love planning meals and making grocery lists, I'm going to be your new best friend in about five minutes. Oh, and if you think this tip only applies to big families, I think you will be pleasantly surprised how well this will work for singles, newlyweds, seniors...well, just about anyone. I only wish that we had found this before kids. We would have saved so much money! Ready for my best mealtime tip?? One of the ladies who came to help when our quadruplets first came home saw me struggling with needing to care for preemies on medical equipment, manage 28 feedings a day, and still have the energy to plan and cook meals. She suggested that I check out a meal planning service called eMeals . I'm a very self-sufficient person in general, but I was desperate for something to make that portion of my day easier. So I checked into it, and loved what I found. I loved it so much that we are still members a year and a half later! 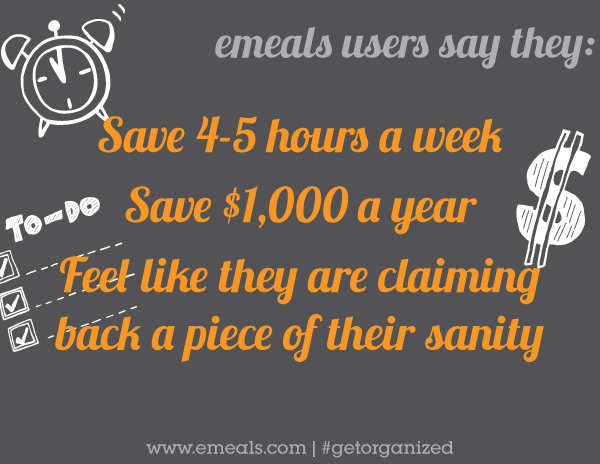 EMeals started off by offering subscriptions to weekly dinner menus with matching grocery lists . Over the time that we've been members, they've added additional menu-types, more grocery stores, and new options for breakfast and lunch. My first concern whenever looking at something like this is always about the cost. Money is very tight at our house, and expenses are cut wherever we possibly can. My concern was that we would be paying out money and it wouldn't be worth the savings. After 18 months using the service, I can still say that it is most definitely worth it! Subscriptions are $7 per month, but if you choose a longer subscription term, the price drops! 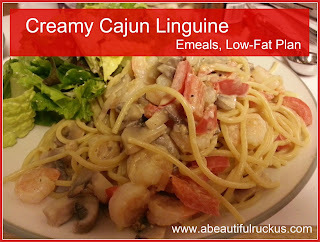 Menus include seven nights of quick and easy entrees and side dishes. 10 different meal plans including Classic, Gluten-Free, Clean Eating, Paleo, Organic, Vegetarian, and more. Plus they let you switch meal plans once a month if you would like to try something else! Weekly recipes and grocery lists for two people or a family of four-six. Plus, all items on the grocery list are numbered to correspond with the correct recipe. If you decide you don't want to cook meal #3, you can easily go through the grocery list and cross off anything with a "3" next to it. Brilliant! Your choice of store that you would like the recipes and grocery lists tailored for. They check sales and build the recipes around those items every week! Each grocery list gives the specific amount of food needed to make the recipes. That means no overbuying and throwing food out at the end of the week. That was a major problem for me prior to eMeals. It used to drive Sean nuts! And I feel like I definitely need to make a comment on the dishes themselves. We really, really enjoy these meals...even the kids! So far, we've tried Classic for Two, Low-Fat for Two, Low-Fat for a Family, and Clean Eating for a Family. Yep, I like to keep it interesting over here! We found that the Low-Fat plans were our favorite because of it's emphasis on herbs and seasonings for flavor and all of the veggies included. We just switched to the Clean Eating plan last week because I thought it would be interesting to try it. I've looked at the Clean Eating concept before, but it was overwhelming...until I saw that they recently added this plan. Now I just let the meal planning service do the work for me, and so far we are enjoying it as well! These are easy & delicious dinner ideas for busy families on a budget ! Here are a couple of meals we've had recently. If you're following me on Instagram, you've probably already seen them come through! 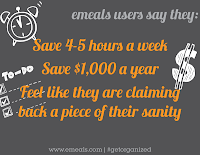 So here's the deal, I emailed the eMeals people and told them how much I enjoyed their service and wanted to be able to pass it on to other multiples parents, newlyweds, frazzled moms, and anyone else who needs to take something off of their plate. They were kind enough to let me pass two different special offers to you! First, if you want to give the eMeals meal service a try (which I can't recommend enough! ), they would like to extend a 15% discount to you with the code NEWYOU. Jump on this people. You won't be sorry! And like I said above, I will be your new best friend! Click this link to sign up! Second, they have offered to giveaway a 3 month subscription to their meal planning service to one reader! You will get to choose your meal plan, meal size (2 people or a family), and store and then let them do the work! On top of that, they will also include a 3 month breakfast and lunch meal plan for you to try! That's 3 whole months of no planning. Just print, shop, and cook the easy and delicious meals! I've had several people mention to me that they would really enjoy participating in the giveaways if I would offer something that isn't limited to Kansas City. I've also had people say that they don't have little kids or multiples so they would like something that would pertain to them. This is it, folks! It's open to anyone in the US and anyone from a single living on their own, to a family with kids, to a senior couple can benefit from this one. I hope you will take a moment to enter. If I sound like I'm really excited about this, it's because I am. EMeals literally saved my sanity during those first hard months with the kids...and now? Why stop a good thing, right? The contest ends at 11:59pm on Monday, January 14th. The winner will be announced and contacted by email on Tuesday, January 15th. The winner will have 48 hours to respond to the email with their information so that the prize can be forwarded to them. A Beautiful Ruckus is not responsible for the delivery of the prize and is not responsible if the sponsor does not deliver. This giveaway is open to residents of the United States. A Beautiful Ruckus received no compensation for hosting this giveaway, however this post does contain my affiliate links. For more info, please see my disclaimer page. The low carb menu plan would be a great choice for my family. I love eMeals! Thanks for getting me hooked on these last fall. As a mom that works outside the home, I need all the time-saving tricks I can get. Having our meals planned means I can come right home and make a great meal for our family. Shopping only takes about 30 minutes (instead of an HOUR or more). And the meals are GREAT!! The low-fat plan also helped us lose weight and maintain it over the past year with the focus on lean meats and fresh veggies. And it has really helped us stick to the budget as well! I am interested in trying and seeing how this would work for us. So fun - thanks for hosting! I tried it over a year ago and for some reason quit. I'm going to give it another try! Thanks for the push. I like three different ones and not sure which I would pick. I like the Paleo, The Low Carb, and the Classic. Of the choices offered, either the low-fat or low-carb 2-person plan appeals to me most :) There are some great ideas there. It's always hard to eat well...especially working 12-hour shifts 3-4 times a week. This would certainly help, even though I'd have to cook ahead of time. Thanks for the awesome recommendation! I like the look of the Simple Gourmet Meal Plan but the others look great too. Hard decision! I have never considered trying something like this, but you definitely have me intrigued! I think my family would like the classic meals option best. -Rustie D.
If I ever have a baby again, I would love to have the low-carb e-meals, because I had gestational diabetes with the last one, and it was really hard to plan good-tasting low-carb meals and work full time. I think I would like to do clean eating - esp since that is a goal of my hubby and mine. The vegetarian for two looks perfect! I would like Clean, Low Fat. Think it's important to plan and I often don't take the time. Low Carb would be ideal for me! I'd choose the Classic Family Meal Plan. I would like the vegetarian for 3 please!! I'd choose the classic Meal plan for two. I really need some meal p;anning help. I would love the classice meal plan. I would like low fat. My problem is I'm single and a lot of times I just don't eat because I don't know what I can fix that there's not a ton of leftovers. Thank you for this wonderful giveaway! This sounds great1 I'm interested in the clean meal plan. I would love to try the low carb meal plan. This looks so interesting and fits right in with my new year resolution to eat healthier! Thank you! I like the Simple Gourmet Plan. Everything looks good. I love the clean eating one! And the vegetarian meal plan! Thanks for the giveaway! I like the Paleo, it is more what my family likes. I will definitely need to try this! Found you through the Harvest blog hop and following you on Twitter. Stop by my blog when you have a moment! I think we would like the Clean Eating Meal Plan. I would choose the Classic Meal Family Plan. This would be a great jump-start to eating low carb meals! I SO need it! I would choose the classic and this looks like a great service to offer. We would do the classic meals. They all look so yummy! I'd go with the Simple Gourmet for 2 menu. Clean eating plan ideal for me and my hubby. He will really like this. Thanks for sharing. Cassie Odom ~ My family of all boys, ages 5, 3, and 10 months would use the Clean Eating one, it looks fabulous!!!! I would pick the low carb . i would like to try clean eating! eMeals looks incredible!! I have the hardest time meal planning and so we do end up eating the same things a lot. Haha! I'd be torn between, low carb and low fat recipes! They look delicious!